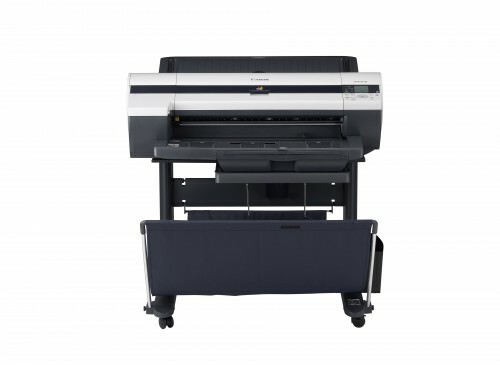 The Canon imagePROGRAF iPF610 24" large format printer produces vibrant full-bleed posters, clear text documents, and crisp line drawings, easily and quickly. Its 24" output will impress clients and colleagues by communicating visual layouts with eye-catching color and exacting details. The imagePROGRAF iPF610 features a Reactive Ink system consisting of four highly colorfast dye inks - Cyan, Magenta, Yellow and Black - plus two channels of pigment-based matte black. Its 24" output will impress both clients and colleagues by printing visual layouts with exact lines, bold text, and dynamic color. This innovative printer employs a new 5 color dye relative ink, which makes for sharper text, clearer line drawings, and more dynamic posters. The ImagePROGRAF iPF610 also features a color system that consists of the four basic colors: cyan, yellow, magenta, and regular black, which are dye based, and two channels of matte black, which is pigment based. Surpassing industry standards with amazingly consistent brilliant, professional grade output, the imagePROGRAF iPF610 is your solution for fast, high quality, document printing and production.